Engineer: Mr. Jerry Thibeaux, P.E. 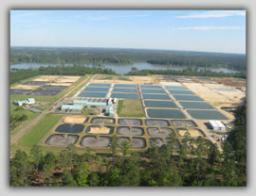 This project began in September 2006 as a simple replacement and reconstruction of ten (10) pond liners and kettles at the Booker Fowler Fish Hatchery in Forest Hill, LA. It has evolved into the replacement of forty (40) one acre ponds and fifteen (15) quarter acre brood ponds. This project as been an excellent project for all parties involved and it is scheduled to be completed and in full operation in March 2010.